This article is about the ship. For other uses, see Amistad (disambiguation). Captained by Ferrer, Amistad left Havana on June 28, 1839, for the small port of Guanaja, near Puerto Principe, Cuba, with some general cargo and 53 slaves for the sugar plantation where they were to be delivered. These 53 Mende captives (49 adults and four children) had been taken from Mendiland (in modern-day Sierra Leone) and illegally transported from Africa to Havana, mostly aboard the slave ship Teçora, to be sold into slavery in Cuba. The crew of La Amistad, lacking purpose-built slave quarters, placed half the captives in the main hold, and the other half on deck. The captives were relatively free to move about, which aided their revolt and commandeering of the vessel. In the main hold below decks, the captives found a rusty file and sawed through their manacles. 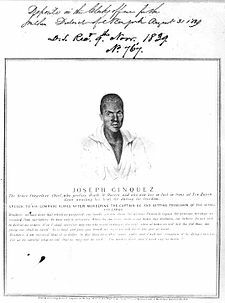 On about July 1, once free, the men below quickly went up on deck and, armed with machete-like cane knives, attacked the crew, successfully gaining control of the ship under the leadership of Sengbe Pieh (later known in the United States as Joseph Cinqué). They killed the captain and some of the crew, but spared Don José Ruiz and Don Pedro Montez, the two owners of the slaves, so they could guide them back to Africa. While they demanded to be returned home, the navigator Montez deceived the Mende about the course, maneuvering the ship north along the North American coast until they reached the eastern tip of Long Island, New York. Discovered by the naval brig USS Washington while on surveying duties, La Amistad was taken into United States custody. The Mende were interned at New Haven, Connecticut, while the courts settled their legal status and conflicting international claims regarding La Amistad's ownership, as well as the status of its property, including the slaves. A widely publicized court case ensued in New Haven to settle legal issues about the ship and the status of the Mende captives. They were at risk of execution if convicted of mutiny. This became a popular cause among abolitionists in the United States. Since 1808, the United States and Britain had prohibited the international slave trade. The ship's owners fraudulently described the Mende as having been born in Cuba and said they were being sold in the Spanish domestic slave trade, in order to avoid the international prohibition on the African slave trade. The court had to determine if the Mende were to be considered salvage and thus the property of naval officers who had taken custody of the ship (as was legal in such cases), the property of the Cuban buyers, or the property of Spain, as Queen Isabella II claimed, via Spanish ownership of the Amistad. A question was whether the circumstances of the Mendes' capture and transportation meant they were free and had acted as free men rather than slaves. On appeal, the United States v. The Amistad case reached the US Supreme Court. In 1841, it ruled that the Mende had been illegally transported and held as slaves, and had rebelled in self-defense. It ordered them freed. Thirty-five survivors returned to Africa in 1842, aided by funds raised by the United Missionary Society, a black group founded by James W.C. Pennington, a Congregational minister and fugitive slave in Brooklyn, New York, who was active in the abolitionist movement. 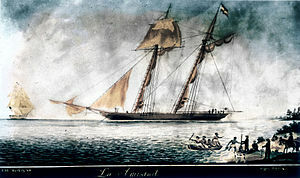 After being moored at the wharf behind the US Custom House in New London, Connecticut, for a year and a half, La Amistad was auctioned off by the U.S. Marshal in October 1840. Captain George Hawford, of Newport, Rhode Island, purchased the vessel and then needed an Act of Congress passed to register it. He renamed it Ion. In late 1841, he sailed Ion to Bermuda and Saint Thomas with a typical New England cargo of onions, apples, live poultry, and cheese. After sailing Ion for a few years, Hawford sold it in Guadeloupe in 1844. There is no record of what became of Ion under the new French owners in the Caribbean. Freedom Schooner Amistad at Mystic Seaport in 2010. A monument dedicated to the revolt on La Amistad stands in front of City Hall in New Haven, Connecticut, where many of the events related to the affair in the United States occurred. The Amistad Research Center at Tulane University, New Orleans, Louisiana, is devoted to research about slavery, abolition, civil rights and African Americans; it commemorates the revolt of slaves on the ship by the same name. A collection of portraits of La Amistad survivors that were drawn by William H. Townsend during the survivors' trial are held in the collection of Yale University. Between 1998 and 2000, artisans at Mystic Seaport, Mystic, Connecticut, built a replica of La Amistad, using traditional skills and construction techniques common to wooden schooners built in the 19th century, but using modern materials and engines. Officially named Amistad, it was promoted as "Freedom Schooner Amistad". The modern-day ship is not an exact replica of La Amistad, as it is slightly longer and has higher freeboard. There were no old blueprints of the original. The new schooner was built using a general knowledge of the Baltimore Clippers and art drawings from the era. Some of the tools used in the project were the same as those that might have been used by a 19th-century shipwright, while others were powered. Tri-Coastal Marine, designers of "Freedom Schooner Amistad", used modern computer technology to develop plans for the vessel. Bronze bolts are used as fastenings throughout the ship. Freedom Schooner Amistad has an external ballast keel made of lead and two Caterpillar diesel engines. None of this technology was available to 19th-century builders. "Freedom Schooner Amistad" was operated by Amistad America, Inc., based in New Haven, Connecticut. The ship's mission was to educate the public on the history of slavery, abolition, discrimination, and civil rights. The homeport is New Haven, where the Amistad trial took place. It has also traveled to port cities for educational opportunities. It was also the State Flagship and Tall ship Ambassador of Connecticut. 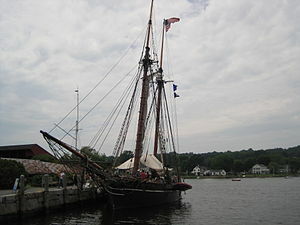 The ship made several commemorative voyages: one in 2007 to commemorate the 200th anniversary of the abolition of the Atlantic slave trade in Britain (1807) and the United States (1808), and one in 2010 to celebrate the 10th anniversary of its 2000 launching at Mystic Seaport. It undertook a two-year refit at Mystic Seaport from 2010 and was subsequently mainly used for sea training in Maine and film work. In 2013 Amistad America lost its non-profit organization status after failing to file tax returns for three years and amid concern of the accountability for public funding from the state of Connecticut. The company was later put into liquidation, and in November 2015 a new non-profit, Discovering Amistad Inc., purchased the ship from the receiver. Amistad has now been restored to educational and promotional activity in New Haven, Connecticut. The slave revolt aboard the La Amistad, the background of the slave trade, and its subsequent trial are retold in a celebrated poem by Robert Hayden entitled Middle Passage, first published in 1962. In Robert Skimin's novel Gray Victory (1988), depicting an alternate history in which the South won the American Civil War, a group of abolitionist conspirators infiltrating Richmond, Virginia calls itself "Amistad". The film Amistad (1997), directed by Steven Spielberg, dramatized the historical incidents. Major actors were Morgan Freeman, as a freed slave-turned-abolitionist in New Haven; Anthony Hopkins, as John Quincy Adams; Matthew McConaughey, as Roger Sherman Baldwin, an unorthodox, but influential lawyer; and Djimon Hounsou, as Cinque (Sengbe Peah). The 1999 hit single "My Love Is Your Love", performed by Whitney Houston, references the "chains of Amistad". In January 2011, Random House published Ardency, a collection of poems written over 20 years by American poet Kevin Young which "gathers here a chorus of voices that tells the story of the Africans who mutinied on board the slave ship Amistad". ^ "Teaching With Documents:The Amistad Case". National Archives and Records Administration. Retrieved March 14, 2013. ^ a b c d Adams, John Quincy (1841). Argument. New York: S. W. Benedict. pp. 13–14. Retrieved January 15, 2017. ^ Lawrance, Benjamin Nicholas (2015). Amistad's orphans : an atlantic story of children, slavery, and smuggling. [S.l. ]: Yale University Press. pp. 130–131. ISBN 9780300198454. Retrieved January 15, 2017. ^ a b c d e f g "Unidentified Young Man". World Digital Library. 1839–1840. Retrieved July 28, 2013. ^ a b Finkenbine, Roy E. (2001). "13 The Symbolism of Slave Mutiny: Black Abolitionist Responses to the Amistad and Creole Incidents". In Hathaway, Jane (ed.). Rebellion, Repression, Reinvention: Mutiny in Comparative Perspective. Greenwood Publishing Group. p. 238. ISBN 978-0-275-97010-9. Retrieved August 18, 2012. ^ "22 Statutes at Large". A Century of Lawmaking for a New Nation: U.S. Congressional Documents and Debates, 1774-1875. U.S. Congressional House Proceedings. 9th Congress. 2nd Session. Library of Congress. p. 426. American Memory. Retrieved July 11, 2012. ^ Webber, Christopher L. (2011). American to the Backbone: The Life of James W.C. Pennington, the Fugitive Slave Who Became One of the First Black Abolitionists. New York: Pegasus Books. ISBN 1605981753, pp. 162–169. ^ "Amistad". Coast Guard Vessel Documentation. Silver Spring MD, USA: NOAA Fisheries. Retrieved January 14, 2017. ^ Marder, Alfred L. "About the Freedom Schooner Amistad". New Haven CT, USA: Amistad Committee, Inc. Retrieved January 14, 2017. ^ "The New Topsail Schooner Amistad". Archived from the original on February 9, 2012. Retrieved August 18, 2012. ^ "State of Connecticut Sites, Seals, & Symbols". Connecticut State Register & Manual. Retrieved August 18, 2012. ^ "Amistad Sails Into Bristol for Slave Trade Commemorations". Culture24. August 30, 2007. Retrieved December 7, 2009. ^ Lender, Jon (August 3, 2013). "Troubles Aboard the Amistad". Hartford Courant. Retrieved October 30, 2013. ^ "State Missed Signs As Tall Ship Amistad Foundered". The Hartford Courant. September 3, 2013. Retrieved October 30, 2013. ^ Lender, Jon (September 4, 2013). "Malloy Wants 'Action Plan' For Troubled Amistad". Hartford Courant. Retrieved October 30, 2013. ^ Collins, David (May 10, 2013). "Amistad still sails some troubled waters". The Day. New London, CT. Retrieved October 30, 2013. ^ "Discovering Amistad". Discovering Amistad. ^ Wojtas, Joe (December 31, 2015). "Discovering Amistad charts new course for schooner". The Day. New London CT, USA. Retrieved January 14, 2017. ^ Bloom, Harold (2005). Poets and Poems. New York: Chelsea House Publishers. pp. 348–351. ISBN 0-7910-8225-3. All this is merely preamble to a rather rapid survey of a few of Hayden's superb sequences, of which Middle Passage is the most famous. Owens, William A. (1997). Black Mutiny: The Revolt on the Schooner Amistad. Black Classic Press. Pesci, David (1997). Amistad. Da Capo Press. Rediker, Marcus (2012). The Amistad Rebellion: An Atlantic Odyssey of Slavery and Freedom. New York: Viking. Zeuske, Michael (2014). "Rethinking the Case of the Schooner Amistad: Contraband and Complicity after 1808/1820". Slavery & Abolition. 35 (1): 156–164. Wikimedia Commons has media related to La Amistad.